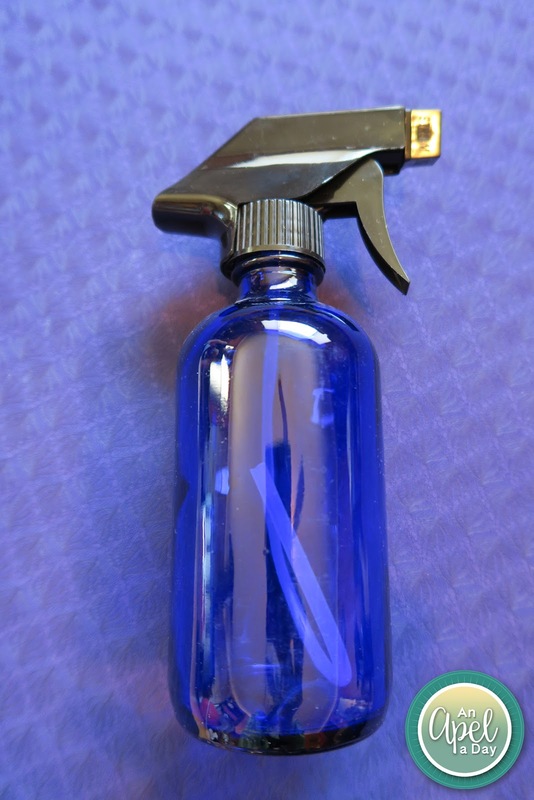 I heart my new Cobalt Blue Glass Bottles with Trigger Sprayer. I've always had plastic, which feels cheap! 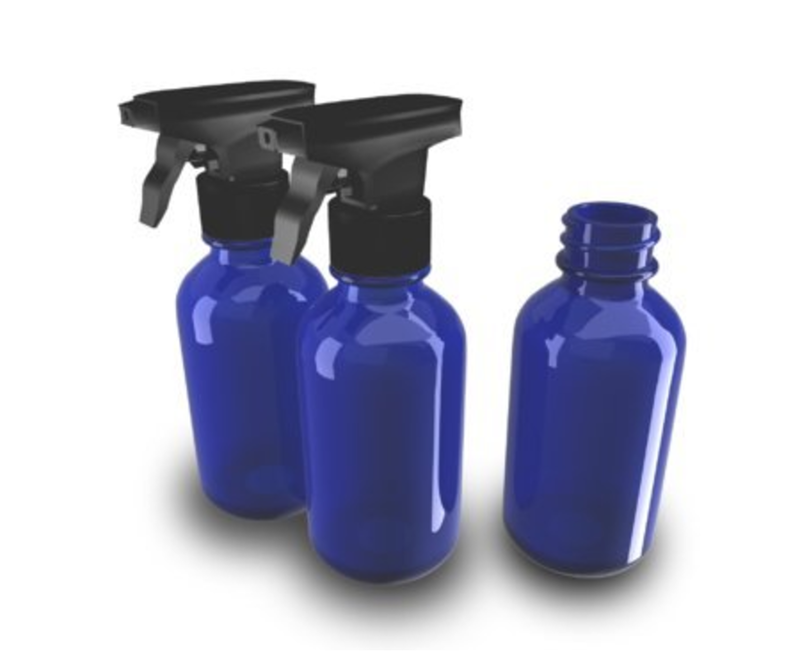 Essential Oils can degrade plastic over time. I never knew that essential oils broke down plastic. Such a great thing to know! I suppose that with kids they could get thrown around and broken. I to can get the case of the dropsies at times. If that happens, well it happens. I still like the idea of chemicals or essential oils being in glass way more than plastic. They were super easy to fill up. Isaak couldn't wait to put water in one of them to test it out. He loves spray bottles. One thing we do a lot is clean around and in the toilet. The boys usually hit the toilet, but there are times where they don't. Up to this point I just used store bought cleaners. I decided to try and make my own. 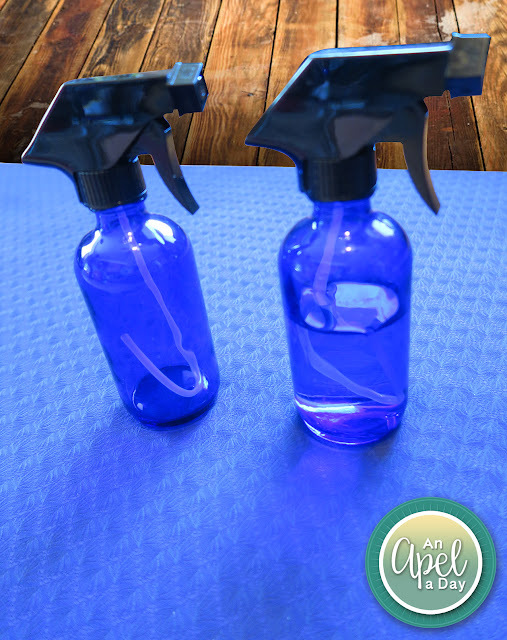 Combine all the ingredients in a bigger bottle, shake well, and put in the smaller sprays. We have specific rags that are used for cleaning. I tend to clean when I know I'm going to do laundry, so the rags aren't sitting around (gross). If I clean when it's not laundry day I go throw the rag in the washer. This one takes a little more preparation, but I like the results. I use this on my kitchen counters. Lemon in the kitchen is such a great scent. I shine my wood floors with this mixture as well. My work uses 409, and my allergies go crazy on cleaning day! That's why I make my own! Cost: The 2 Cobalt Blue Glass Bottles With Trigger Sprayer are $12.95. It may be more expensive than plastic, but so worth it! Because they are cobalt blue bottles they don't even look tacky sitting around. They maintain liquids sensitive to degradation from light and cobalt blue glass protects against harmful UV rays. 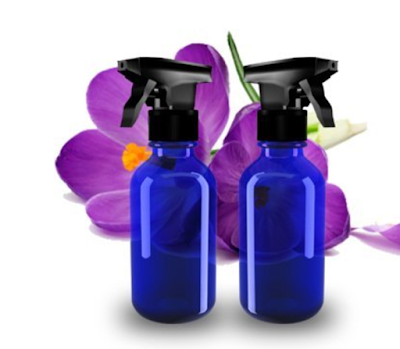 They are excellent for around the house cleaning projects, chemicals, cooking and beauty applications Perfect For Essential Oils, Perfume Oils, Colognes, weed killer, and other liquids. What would you make, and put in these bottles? Disclaimer: I received Cobalt Blue Glass Bottles With Trigger Sprayer to review. I wrote this post, and was not influenced at all with an opinion. I only review things that I find interesting, or that would benefit my readers. I love to make my own cleaning products and always use dark colored glass bottles like these. I even make my own air fresheners too. Love the blue color! I guess I will use it for the fertilizer and more..
What is it with boys and their aim? Wish Broxton was better at it.